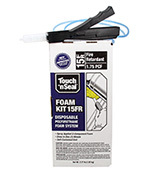 Foam Kit 15 is a completely self-contained 2-component foam system that is portable and disposable. Complete with pre-attached hoses and wand applicator, Foam Kit 15 provides fifteen board feet of polyurethane spray foam that expands 30X and dries in 2 - 5 minutes. 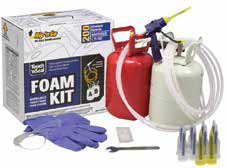 Foam Kit 200 is a self-contained 2-component foam system that is portable and disposable. Complete with pre-attached hoses and ergonomic foam applicator, Foam Kit 200 provides two hundred board feet of polyurethane spray foam. The convenient “Rip ‘n Go” packaging allows for quick and easy setup and comes with conical and fan nozzles to help you achieve the best possible results for your insulation project. 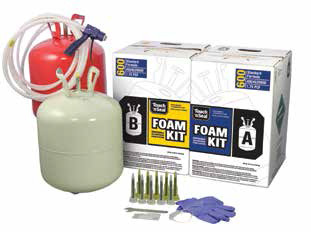 Foam Kit 600 is a completely self-contained 2-component foam system that is portable and disposable. Complete with color-coded hoses, ergonomic foam applicator, and all the necessary tools to get started, Foam Kit 600 provides up to six hundred board feet of polyurethane spray foam. Designed for larger insulating, sealing, patching and filling applications.